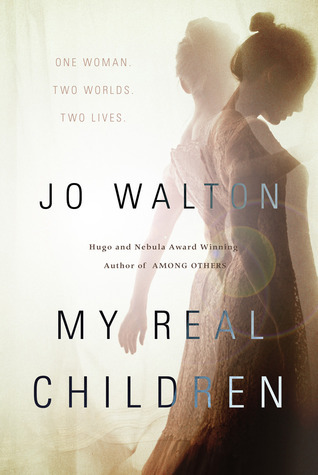 Jo Walton's My Real Children is one of those books that I loved and completely devoured, but I cannot entirely pinpoint why. The story is about Patricia Cowan. Patricia is getting older, and she forgets many things, big and small, that have happened to her over the past few years. But she also remembers things, big and small, that she could swear happened, but don't make sense in her current circumstances. Patricia seems to be living two lives, in two separate worlds. Her life was all on a steady path until one day, she made a decision, and based on that decision, her life (and the world she lived in) went in two very different directions. I love almost any alternate reality or alternate universe story, so I was predisposed to enjoy this one. I appreciated that it was, for the most part, set after WWII rather than before or during the war. Yes, the second world war had stunning effects on the world and how it has turned out, but events and decisions made both before and after the war have had enormous impact as well. I am now about a week removed from having read this book and I admit that I am not sure why I loved it so much. I gave it an unreserved 5-star rating when I finished it. I loved Patricia, I loved how she made the best of circumstances no matter what they were. I felt so saddened by the way her children, in both lives, relegated her to the background as she got older. I enjoyed the subtlety with which Walton introduced societal prejudices into her narrative. For example, in one world, Trish and her partner, Bee, seem to have no issues whatsoever with their son being in a polyamorous relationship. It just seems to be what he chooses and they are fine with it. They are, however, quietly concerned when their daughter marries a Muslim. Walton does not delve very deeply into this (though, admittedly, she doesn't delve deeply into very much, which I will get to in a bit). But most people don't like to examine their prejudices, so in a way, it was quite realistic. Jo Walton writes about the small, personal, everyday acts of our lives wonderfully. In all her books. You get such a vivid sense of a character's day-to-day activities, and I really enjoy how she gives such care and attention to things that all of us view as trivial, but are the events that fill our lives. She does this so well in very slim volumes; her stories are compact and self-contained and somehow still deeply moving and I love that about them. That said, in this one, I just feel like there was so much that was left out. And I say that now, but please remember that I loved it. It is only now, a week later as I write this review, that I am mulling a bit. We hear about big world events in an off-hand manner, in both worlds that Patricia inhabits, but never quite enough to understand what the situation is. We see only minor inconveniences, mainly to outlying characters. Though we have the idea that there are stresses on Trish's family in one version of her life, we don't see anything very drastic happen. Again, this is part of Walton's skill; most people don't have hugely dramatic events in their lives, they just make the most of what they have and try to soldier on and be happy. I wanted a bit more context. Also, the book takes place over several decades, and in two very different worlds. Because of that, we hardly get to know any of the other characters at all. They flit in and out but do not have a solid presence. Good friends from college are rarely mentioned again, the children are all vaguely there but with hardly any impact on life, spouses are either horrible or perfect with no real personality or depth, and the world keeps turning but what happens on that world is not shared in any great depth. Because of that, at the end, when Patricia is trying to make sense of whether she would rather have a happy life in a horrible world or a sad life in a much better world, it was hard to feel compelled in either direction; I did not know enough to compare the two worlds at all. So, this book! I loved it and read it so quickly and enjoyed it hugely. But, looking back, I feel like it could have had more depth. If you want to read about the impact that big events have on small lives, this is wonderful. If you want something... bigger? Then, maybe not this one. So, I liked this book, but it wasn't my favorite of hers. I agree with you that it felt like things were missing, but whereas in Among Others, I thought the things Mori didn't tell us were nevertheless guessable based on what she DID tell us, I didn't have that same feeling reading My Real Children. It's still a good book, but not my number one Jo Walton novel. Jo Walton is high on my list of authors to read but I still haven't quite gotten around to her books. Maybe I will not jump into this book first. I want to read her Among Others first and then her Small Change trilogy.